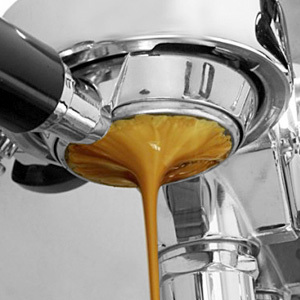 Below you will find some of the best prosumer dual boiler espresso machines on the market. We are very selective in dual boiler models we carry. Dual Boiler Espresso Machines have superior control over Heat Exchangers in the temperature control of the boiler water. This better temperature control allows you to change the boiler water temperature to match better with your current coffee blend. The superior temperature control offers a better extraction in the quality found in the cup. Therefore, 1st-line ‘considers’ the PID dual boiler machine is a better choice for espresso-only consumption. There have been arguments that the coffee boiler size on a dual boiler can determine espresso quality in the cup. For example, some argue that a smaller boiler will have faster turnover of the water. As a result, this fresh water makes superior espresso. At first, we were a believer in this camp before we carried dual boilers. We no longer believe this theoretical model holds true. Our reasoning is that if the smaller coffee boiler theory held true, then a heat exchanger machine with a much smaller capacity would make extract superior espresso over a dual boiler machine. espresso quality is “not important” since milk will dilute the espresso and the quality of the cup will be insignificant. The Vibiemme heat exchanger model takes about 20-30 minutes to warm up. The dual boiler version takes about 30-45 minutes to warm up both boilers. You can place Vibiemme espresso machines on a timer. However, you MUST plug the timer in the wall outlet first. Then a surge suppressor (1080 joules or higher), and then either model into the surge suppressor. On the La Spaziale dual boiler machines, only the Version 2 can accept a specialized Spaziale timer. The Version 1 units can not be on a timer at all. The dual boiler version allows the user to independently turn on/off the coffee boiler or steam boiler. As a result, if the user only operates the coffee boiler, electrical usage is only 600 watts for the coffee boiler heating element. In contrast, a heat exchanger has one on/off switch for the entire machine.